The U.S. farm sector is in the midst of a major downturn. As we discussed a couple of weeks ago, 2016 looks to be the third straight year of declining farm income. Much of this has been driven by falling commodity prices, but the story is a bit more complicated than just falling commodity prices. This week we look at how expenses and net income have evolved in the sector. This week we use sector level financial ratios developed reported by the USDA’s Economic Research Service. It is important to remember that these measures are aggregated measures, and are not representative of an “average farm.” Rather they simply add up all the income, expenses, assets, and debt in the sector in an effort to understand the overall health of the sector. While the aggregate measures have some drawbacks as opposed to actual farm level data, in our opinion they provide valuable information about the overall health of the sector. You can check out this link to see documentation on how ERS calculates the ratios as well as some rationale for their use. The sector’s ability to generate earnings is one of the most fundamental keys to its financial health. As we have discussed, recent declines in commodity prices have played a key role in the decline in net farm income. However, the deterioration in net income has more drivers than just falling commodity prices. Figure 1 shows three measures of profitability for the farm sector, the operating expense ratio (blue) and the net farm income ratio (red). Both of these ratios are calculated by dividing the measure of interest, e.g., operating expenses to the value of farm production. Figure 1. 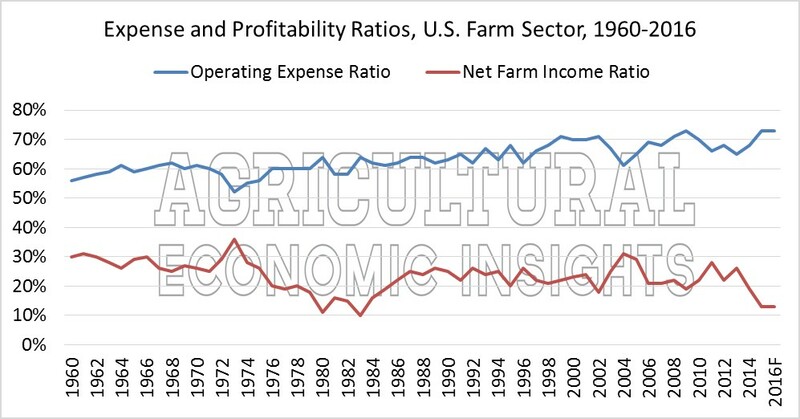 Operating Expense and Net Farm Income Ratios, U.S. Farm Sector, 1960-2016. As one might expect, the most volatile of these series is the net farm income ratio. This measure shows what proportion of the value of production is left after accounting for all expenses. The ratio has stood at 13% for both 2015 and 2016. This means that the total costs of production account for all but 13% of the value of production. This value is quite low by historical standards. Since 1960, the net farm income ratio has been this low only 4 times, 2015, 2016, 1983, and 1980. From 1985 to the current downturn starting in 2014, the only times this ratio has slipped below 20% occurred in 2002 and 2009. Clearly, output price declines have played a role in the falling of the net farm income ratio. However, the operating expense ratio (in blue) suggests that operating expenses have not fallen as rapidly as the value of production. We have often referred to this as the margin squeeze and have tried to explain some of the reasons that it has occurred. Operating expenses are defined as all expenses less interest expenses and capital consumption (a proxy for economic depreciation). Examining the operating expense ratio, one can see that operating expenses as a proportion of the value of production have trended upward for a long time, but the jump in the mid 2000’s is definitely noticeable. Today, operating expenses account for 73% of the value of production, a level last seen in 2006. Operating expense ratios of 70% are not unprecedented. From 1999 to 2002 they were 70 to 71% of the value of production. However, net farm income ratio for all of those years except 2002 was above 20%, a value significantly above today’s 13%. While 7% may not sound like a lot, keep in mind that the 2016 value of farm production is forecast at $417 billion, making each 1% worth $4 billion, not a trivial amount. If the net farm income ratio were 20%, net farm income would rise to $82 billion, a level of income that would change the current discussion dramatically. How did the sector maintain a much higher net farm income ratio in spite of similarly high operating expenses during the early 2000’s? As we pointed out a couple of weeks ago, one factor was much larger government program payments made during the previous downturn. In real values, government payments from 1999, 2000, and 2001 were more than two times the amount expected in 2016. Additionally, capital consumption chews up a slightly larger amount of the value of production today (11%) than it did in those years (8%) (again remember that each 1% is worth about $4 billion). Today, farm profitability relative to the value of farm production is very low. This has been driven by a variety of factors. First, commodity prices have fallen sending net income and the value of production lower. Second, operating expenses have not fallen as rapidly as the value of production. Even though some expenses such as fertilizer and fuel have fallen considerably, operating expenses remain elevated when compared to the value of production. Third, there have been periods when expenses were this high and profitability didn’t fall as dramatically. This was in part due to larger direct government payments and lower capital consumption. The level of net farm income relative to the value of farm production is very low by historical standards. If this level persists, it will undoubtedly create more financial stress in the farm sector. Moving forward, it is clear that operating expenses will have to fall further to restore profitability to levels more in line with historical standards, in part because government program payments are unlikely to rise to levels seen in previous downturns. As we have noted before this will also continue to put downward pressure on fixed asset investment and values. In the next few weeks will look at financial conditions including rates of return on farm assets, liquidity, and solvency.